It has been nothing but a stream of visitors since we started Project Pink Day. We’ve loved connecting with those we care about most. Lately it has been our families coming to visit us again. On Mother’s Day weekend my mom and dad came for a visit and NOT because of Mother’s Day. My brother was proposing to Lara and he wanted everyone to be there to celebrate. Our parents and Lara’s parents were all able to make the trip. 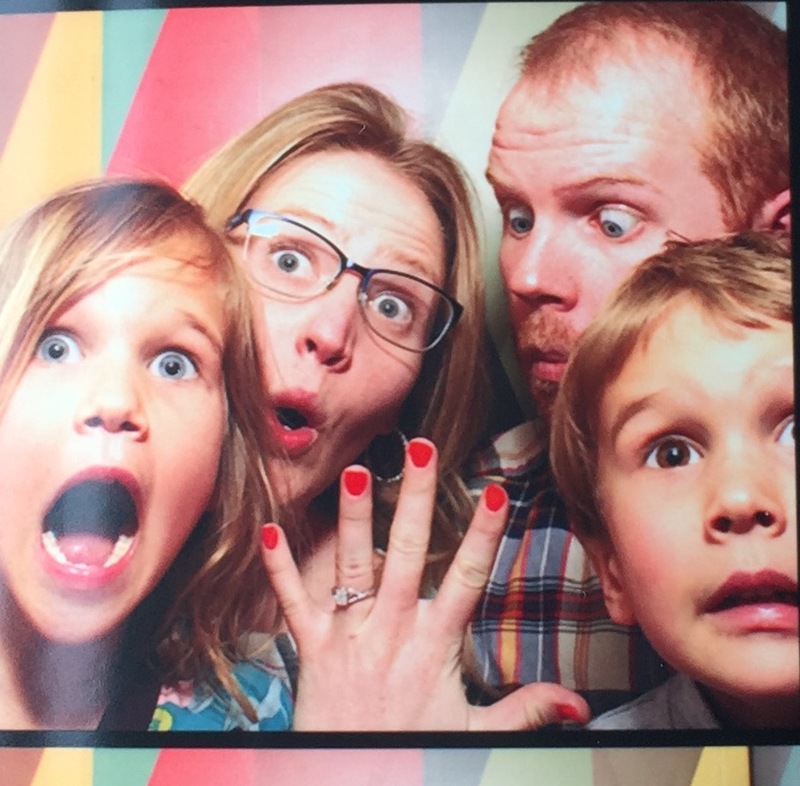 We surprised Lara by being at their home in Denver when they came home after popping the question. Later we all celebrated that afternoon with their friends at Ratio Beerworks and then a nice dinner with the family again. We are very excited to officially have Lara become Aunt Lala (as the kids call her). On Mother’s Day we had a great breakfast at cousin Kim and Mike’s place, where we had stayed that night. Then we headed up to Winter Park to see the new condo that Dustin and Lara had purchased. It is a great place and after they do a little bit of refreshing the paint, etc. we will have a great 2nd mountain option for ski weekends! That afternoon we all said our good-byes to Grandpa Kev and Lara’s parents and took Grammy with us back to Breckenridge. The plan was for her to stay until the following Saturday. This meant Grammy got to come to Zoe’s Spring Concert where the kids put on a show about Mozart and most of them were cute, little mice. 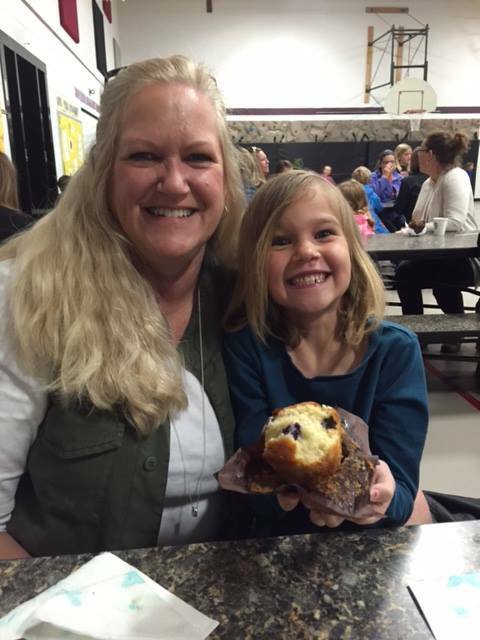 She also got to go to the Muffins with Mom event at Zoe’s school with Kelly. She even brought the kids the Pie Face game. We all were cracking up when playing – a new favorite! Something changed with Grammy’s work, so she was able to stay an extra week. She took advantage of the time to go spend the weekend in Denver with Dustin and Lara and came back for another week. With her extra time she got to take Zoe for some “secret shopping” (they said the were just going for a walk) and all the girls went for some pedicures one morning. Alex took her on tours of the construction sites to tell her all about the trucks he has become obsessed with. Kelly, Grammy and the kids went around town looking for the baby foxes and finally saw them playing outside their den one night. They all came home excited to tell me about them. Since we had to take Grammy to Denver to catch her flight anyway, we decided to stay at Dustin and Lara’s one of the nights and headed to The Big Wonderful event she had gone to the weekend before. It is part flea market, part food truck and part live music event and the kids had a great time playing in the sand, climbing to top of the double decker bus, and enjoying the music. It was an action packed couple of weeks, but we had a great time, will be adding another Opheim to the family and spent some quality time together. We decided to leave Summit County (something we rarely have done since moving here) and head to Colorado Springs for Memorial Day weekend. We planned to basically re-live a trip Kelly had made there when she was younger with her parents. On the agenda was the Garden of the Gods, Cave of the Winds, Seven Falls waterfall and just exploring the area. Kelly’s Uncle Ken, Aunt Mary Beth, cousin Kim and her husband Mike were also planning to visit the sites down there too. So, we all met up on Saturday morning at Garden of the Gods. Parking took some time to find, but we eventually got to walk around this amazing place with big, jagged, red rocks all around you. You could hike up onto some of them and see the expansive views. We grabbed lunch and beers at Bristol Brewing Company afterward. It was a cool place that had turned an elementary school into a microbrew pub. It was a perfect day, so we all sat outside on the large deck. Afterward we parted ways and went to check into the Buffalo Lodge. Now, this is where Kelly stayed with her folks over 20 years ago. Let’s just say it wasn’t exactly a 5 star place then and not sure if many updates have been made since. We settled on the word “rustic” in the end. That night we had some amazing Mexican food at Crystal Park Cantina (seriously go there if in the Springs) and then grabbed a beer at Manitou Brewing Company. Kids had a great time playing in the courtyard. Afterward we did some shopping and let the kids get a souvenir at a local shop. The next day we were busy. We started with breakfast at a place called Mo’s Diner and Lounge. Again, it is where Kelly had eaten with her parents years ago, but unlike Buffalo lodge, this place was great! Afterward we headed to Seven Falls. We had unbelievable weather again to walk through the canyon leading up to the waterfalls. The kids and I decided to hike up the 224 steps to the top and look back down. It was cool being that close and hearing the water roar. In the afternoon we headed for an hour long tour of the Cave of the Winds. It was amazing to see the surrounding canyon and to think of how people used to do the cave tour by only crawling and by way of lit candles. Of course, now there are walkways and electricity, but on the tour they turn our the lights and light a single lantern. Spooky for a minute but the kids were brave. It was a great trip and was nice to share some of it with family. It felt good to be out somewhere new and exploring more of Colorado. Something we will continue to do while living here. Our next visitors were Kelly’s parents Karen and Dan. Or, as the kids call them… Mema and Bumpa. I picked them up from the Denver airport early Thursday morning. Timing was perfect because Zoe’s Kindergarten graduation was that afternoon and it was Zoe’s last day of school. The kids sang a couple of songs and then they called out their names to come get their “diplomas”. Super cute! During the weekend we headed over to a town called Leadville. It is an old mining town and is the highest town in Colorado at 10,152 feet in elevation. We walked around the town a bit and went on the Leadville Train tour. It was a nice slow train up the mountain with great views down into the valley. Weather was perfect so we sat in the open car and enjoyed a day in the mountains. Mema and Bumpa also happened to visit the same weekend as the BreckCreate’s WAVE: Light + Water + Sound art show. There were cool displays all over time using these elements to create unique, interactive art shows. The kids’ favorite was called The Pool. It was these colorful discs on the ground they could jump on and they’d continually change colors. We all really liked the Light Origami, which felt like you were inside a kaleidoscope. The weather was perfect all week long. We spent our time feeding the trout by the dredge, walking by the construction sites to look at the construction trucks, watching t-ball practices (Zoe and Alex are on the same team) and enjoying daily trips to get ice cream from Clint’s. We were all sad when Mema and Bumpa had to leave the following Thursday. It was an action packed week. The kids loved their snuggles, ice creams and kisses. We’ll see them all again in September! Uncle Mike, Aunt Pam and cousin Meghan arrived on Friday, June 10th, which was Kelly and I’s 10-year Wedding Anniversary! Once we got them settled in, Mike and Pam were kind enough to let us sneak out for a celebratory dinner at Briar Rose. We had a fun night reminiscing over steak and wine. Saturday morning Zoe and Alex had their first T-ball game in Dillon just below the dam. Their team name is the Hot Rods and all the kids had fun in their new yellow jersey’s. It was also the Dillon Air and Water Show. The team didn’t need any further distractions to stay focused, but with planes doing dive bombs everywhere I think we all were more interested in that. So, after the game we went to the Dillion Amphitheater to get front row seats at the action. The tricks, weather and fact that the backdrop was the Rocky Mountains was all amazing. But, I have to say it was not nearly as impressive as the Chicago shows we used to see. What was nice… the ability to show up in middle of show, find parking a block away and even got seats for us all at a picnic table. 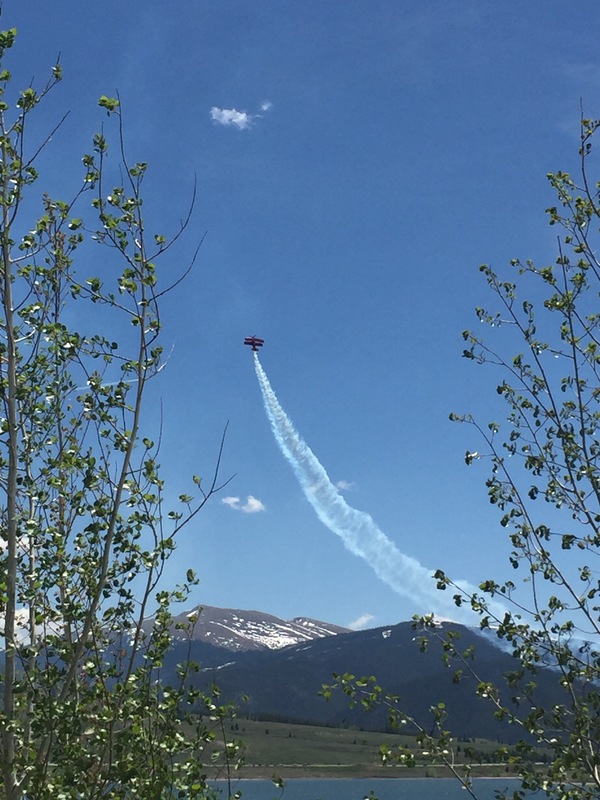 The show ended with 3 F-16s doing a flyby and we headed back to Breck for lunch at Canteen. The next day was Sunday and the last day that A-Basin ski area was going be open. Since Aunt Pam is a big skier we decided to head over to ski – just to say we did! Pam borrowed all of Kelly’s stuff so it wasn’t going to cost a thing. Mike and Meghan came along too to watch. We were pleasantly surprised that it wasn’t too crowded, the snow at top still skied pretty good and now Pam can mark “The Legend” off of her bucket list! 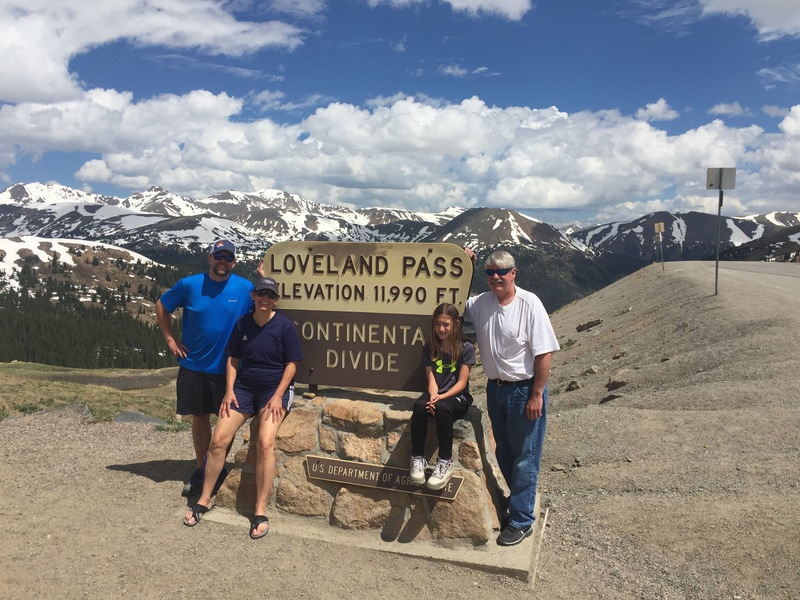 On the way home we decided to drive over Loveland Pass and stop for the mandatory photos. 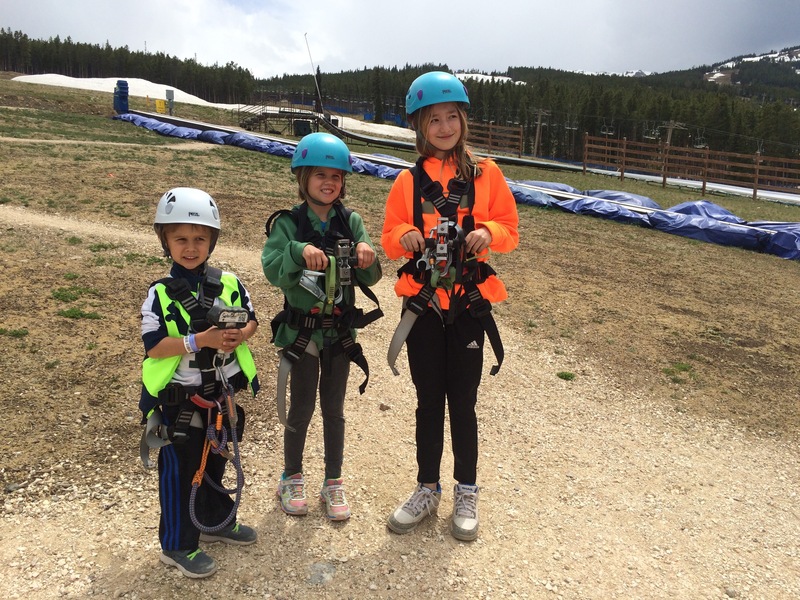 After a quick lunch we got back to Breckenridge, grabbed Kelly and the kids and we all headed up to the Peak 8 Adventure Park. Mike was nice enough to treat us all to some all access passes. We took full advantage by going down the alpine slide, roller coaster, scenic chair lift, panned for gemstones (a kid favorite) and even did the kids base camp. Zoe and Meghan chose to do the kid’s zip line. Alex did the ropes course. It was such a great time! Our Sunday fun day wasn’t done yet. We decided to grill a feast of steak and salmon back at our place. After the long day, it was probably a good choice since the kids were tired after all the excitement. Mike, Pam and Meghan got up early the next morning to head to Colorado Springs. We are so glad they were able to make the trip and make some lifelong memories as a family. It has been another incredible run of visitors. We’ve started to realize that living here in Breck means we will likely have people visit all the time… just the way we like it! < Travis’ Year is Up!